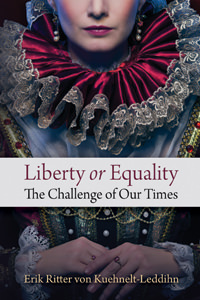 Sometime in the 18th century, the word equality gained ground as a political ideal, but the idea was always vague. In this treatise, Erik von Kuehnelt-Leddihn argues that it reduced to one simple and very dangerous idea: equality of political power as embodied in democracy. He marshals the strongest possible case that democratic equality is the very basis not of liberty, as is commonly believed, but the total state. He uses national socialism as his prime example. He further argues the old notion of government by law is upheld in old monarchies, restrained by a noble elite. Aristocracy, not democracy, gave us liberty. On his side in this argument, he includes the whole of the old liberal tradition, and offers overwhelming evidence for his case. In our times, war and totalitarianism do indeed sail under the democratic flag. This book, capable of overturning most of what you thought you knew about political systems, was first published in 1952.